Figure 1. 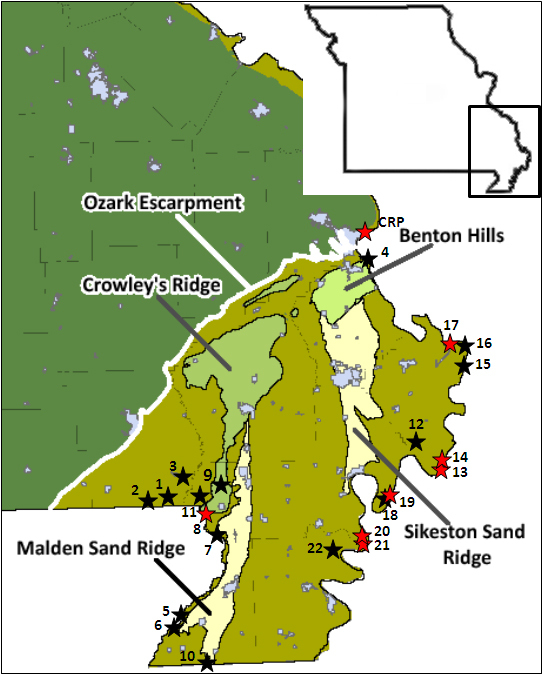 Sites surveyed in southeastern Missouri for Cylindera cursitans during 2007–2010. Site numbers are referenced in Table 1 (CRP = Cape Rock Park), with red stars indicating sites where C. cursitans was observed. Black box on inset map of Missouri denotes main map area (bordering states include AR to the south and TN, KY, and IL to the east). Volume 43(3) of the journal CICINDELA was published a few weeks ago, and I can truly lay more claim to the issue than anybody else (except perhaps Managing Editor Ron Huber). In addition to having one of my photos (a face-on shot of Tetracha carolina) featured on the cover, I was coauthor on the first of two papers included in the issue and lead author on the second. (And to complete my stamp of ownership, I did the final assembly of the issue as the journal’s Layout Editor.) The two included papers each report the results of surveys conducted in the Mississippi Alluvial Plain of southeastern Missouri (also called the “bootheel” in reference to its shape—see Fig. 1) for tiger beetles whose occurrence in that part of the state was previously not well known. In the first, Fothergill et al. 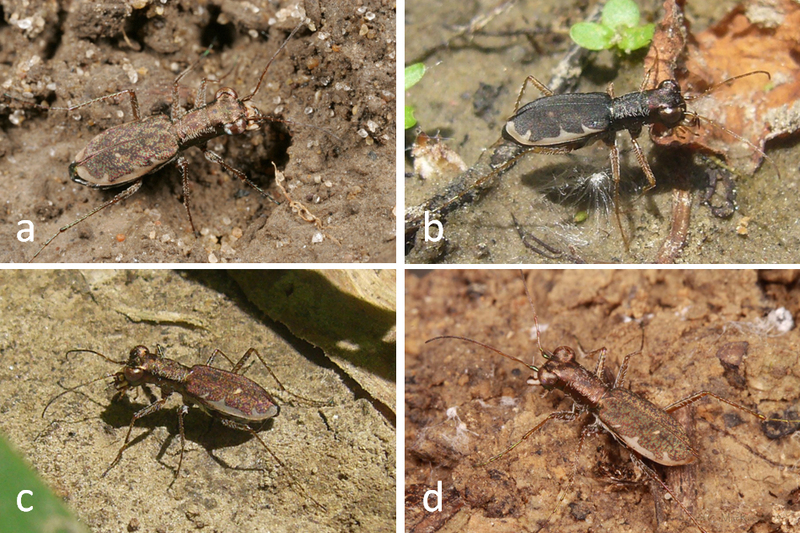 (2011) used a novel survey technique that involved searching beneath irrigation polypipe in agricultural fields to find Tetracha carolina (Carolina Metallic Tiger Beetle); while the second paper (MacRae et al. 2011) reports the results of a multi-year survey to characterize the distribution, habitat associations and conservation status of Cylindera cursitans (Ant-like Tiger Beetle). Together with our three papers on Habroscelimorpha circumpicta johnsonii (Saline Spring Tiger Beetle), Dromochorus pruinina (Loamy Ground Tiger Beetle) and Cylindera celeripes (Swift Tiger Beetle)—all published in the past year—these two papers officially complete the battery of publications that describe our survey efforts for the five tiger beetle species considered of potential conservation concern in Missouri when Chris Brown and I began our faunal studies of the group more than ten years ago. The first three papers clearly painted a rather gloomy picture—H. circumpicta johnsonii is possibly extirpated from saline spring habitats in central Missouri, D. pruinina is limited to a 2.5 mile stretch of roadside habitat in western Missouri, and C. celeripes is restricted to a few patches of critically imperiled loess hill prairie habitat in extreme northwestern Missouri. Happily, prospects for T. carolina and C. cursitans in Missouri are much better. While both are limited in the state to the southeastern lowlands, our surveys indicated that populations are sufficiently robust and widespread in the area to alleviate any concerns about the potential for extirpation. Tetracha carolina in particular was found abundantly in agricultural habitats and appears to have adapted well to the extensive modifications caused by conversion of the cypress-tupelo swamps that formerly covered the region. Cylindera cursitans (Fig. 2) hasn’t shown nearly the same adaptive capability as T. carolina; however, it has nevertheless found suitable refuge in the ribbons of wet, bottomland forest that persist between the Mississippi River and the levee systems that protect the region’s farmland. For a time it seemed that the same habitats along the St. Francois River that bound the western side of the region weren’t suitable for the species, but after much searching (in often tough conditions!) Kent finally managed to locate a population on the Missouri side of the river opposite a known population in Arkansas. Figure 2. Cylindera cursitans in southeast Missouri: a) New Madrid Co., Girvin Memorial Conservation Area, 6.vii.2007; b-c) Mississippi Co., Dorena Ferry Landing, 6.vii.2008; d) Mississippi Co., Hwy 60 at Mississippi River bridge, 20.vi.2009. Photos by CRB (a) and TCM (b-d). Both of these species illustrate how healthy populations of insects are able to hide right beneath our noses. Previous to our surveys, records of T. carolina and C. cursitans in southeastern Missouri were scarce (the latter consisting of a single specimen in the Enns Entomology Museum at the University of Missouri in Columbia, and with considerable searching required before the first field population was finally located). In both cases, perceived rarity was a result not of actual rarity, but rather specific habitat requirement or unusual behavior. While I get great satisfaction out of finding populations of “rare” species and increasing our understanding of their habitat requirements, I also can’t help but wonder if they truly are rare and how many populations I might still have missed—populations that I would have found had I searched in a slightly different manner or at a slightly different time. Fothergill, K., C. B. Cross, K. V. Tindall, T. C. MacRae and C. R. Brown. 2011. Tetracha carolina L. (Coleoptera: Cicindelidae) associated with polypipe irrigation systems in southeastern Missouri agricultural lands. CICINDELA 43(3):45–58. This entry was posted in Cicindelidae, Coleoptera and tagged beetles, conservation, entomology, insects, literature, Missouri, nature, science, tiger beetles. Bookmark the permalink. I loved the papers in CICINDELA. I too enjoy the finding and learning about the rarities in Coleoptera, with the hope of learning more about their behavior and habitat requirements. Only then can we better understand their true status in the environment and maybe find that they aren’t actually rare. I’ve looking for one of our western species of Cylindera for years, and am coauthoring a paper with a couple of my buddies on the results of our efforts. I’m happy to have the whole series published. Now time to start working on the book! Sounds like a great project and nice to know that at least one of the tigre beetle species has been able to adapt to anthropogenic habitats. I too find it difficult to come to grips with ‘rare’ in terms of an arthropod. I find ‘geographically restricted’ or ‘ecologically limited’ easier to think about, but as you demonstrate, even a relatively large and colourful beetle can be easily overlooked. I hope I’m never asked to comment on a potentially rare or endangered mite. I couldn’t give a scientifically valid answer unless it was about an obligate associate of a rare vertebrate or plant. I’m hesitant to call anything rare until we actually know that to be the case – Coral Pink Sand Dune Tiger Beetle, Puritan Tiger Beetle, etc. are examples. They’re not rare because we haven’t figured them out yet, they’re rare because we have and know where they are and where they aren’t. I get frustrated with those who try to list things on our state endangered species list because there are only a handful of records from the state – that’s not rare, that’s just unknown. Isn’t the area you are talking about at the extreme edge of T. carolina’s range? Yes, T. virginica is the same here – often overlooked because it is nocturnal. Tetracha carolina, however, reaches the northern limit of its distribution in southeast Missouri, although exactly how far north it occurs is still a bit of a mystery (there was one Carter Co. record of the species – the next county north and west of the bootheel).